May and Yam are back in 2016! It all started in 1993 in the Amiga computer! Spawn fruits instead of power ups when the power-up level is already maxed-up. Fix bug that allowed for infinite tennis balls in some situations. May & Yam for iOS and tvOS is out! 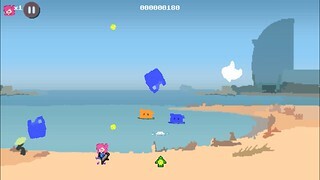 May and Yam Against Pollution for iPhone, iPad, iPod touch, and AppleTV is out now!